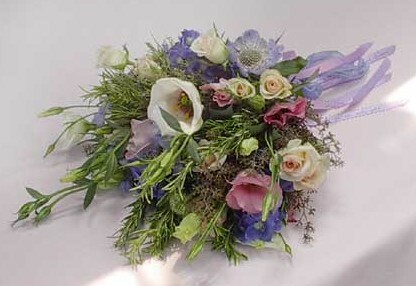 A bride's toss bouquet is actually made of small individual flowers or small bouquets. 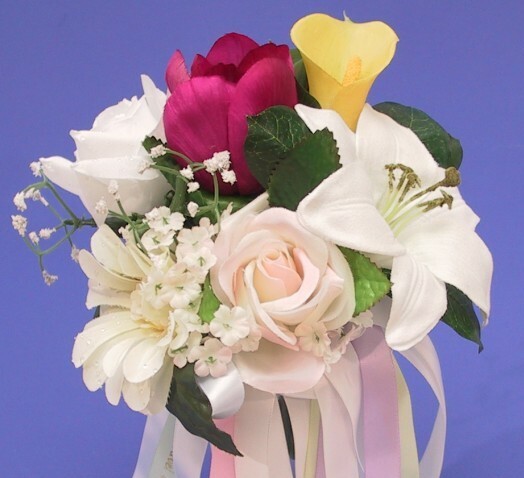 Each single flower/small bouquet has a ribbon tied around it - attached to the ribbon is the charm. 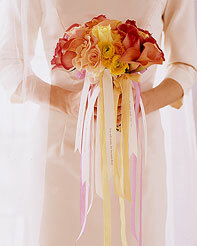 Tie the individual flowers together with a ribbon until you are ready to toss it. The small flowers with the charms attached separate and instead of having one fortune told ( the traditional one bouquet catcher who will be the next to marry), you will have multiple predictions for your single friends. 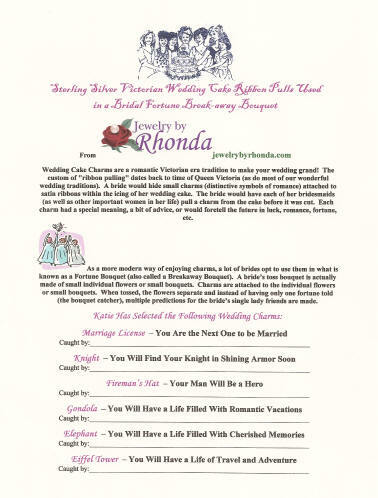 We include a Personalized Description Card with each charm order. You can also request a second sheet with individual descriptions for you to cut apart (no charge) - just let us know you need the second page. 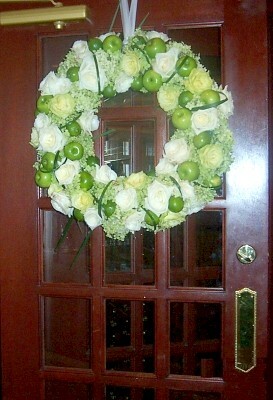 Have You Heard of a Wedding Wreath? 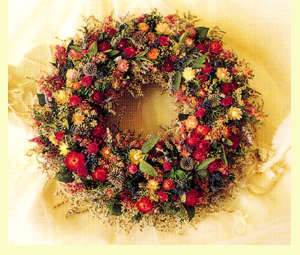 A wreath is a symbol of unity. A gorgeous wreath as a centerpiece on the table at a wedding reception, rehearsal dinner, bridal shower, bridesmaid luncheon/brunch/tea, etc. is a great old-fashioned idea. 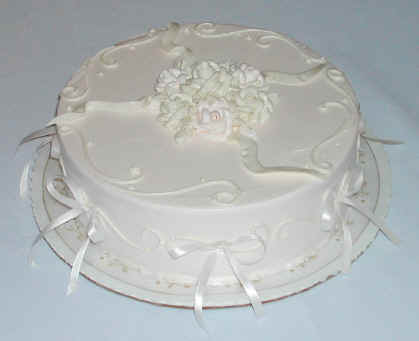 A wreath is a nice addition at the bottom of a footed cake stand or with a punch bowl in the center of the wreath. 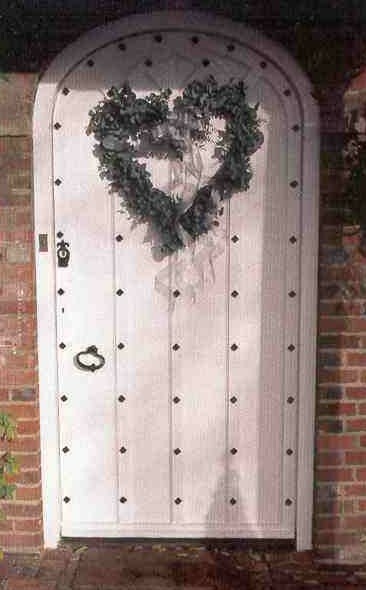 You can also hang the wreath on the entrance door of the church on your wedding day (then move it to the reception site). 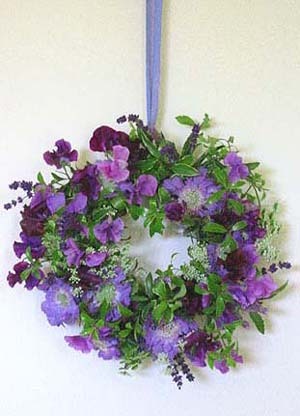 The wreath can be made of fresh or silk (dried or preserved) flowers. 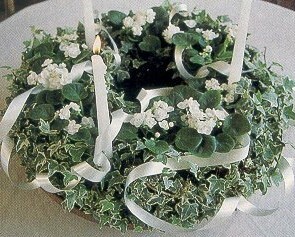 If you like the idea of fresh flowers and live greenery for the wreath, here are instructions for a "living" wreath: http://www.englishcreekgardens.com/livingwreath.htm. 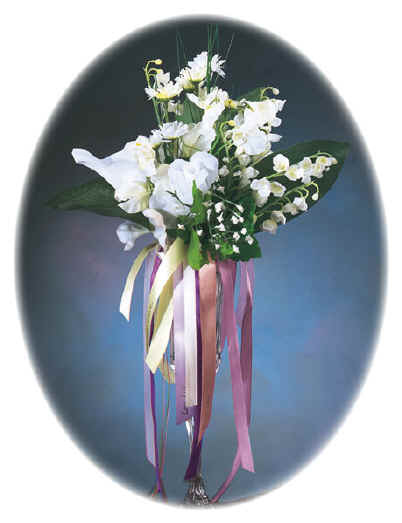 The bride can preserve the flowers used in the wreath or even re-plant the greenery. Use the charms with the wreath - you can have the bridesmaids pull the charms from the wreath. If you are hosting a bridal shower/luncheon/tea etc., hang a wedding wreath on your front door to greet guests - then, give the wreath to the bride as a gift for her to take home. 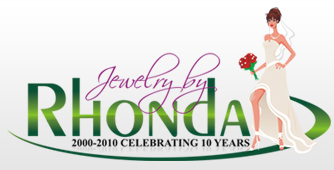 Here is an idea from Heidi, a bride in Prescott, AZ: "Hi Rhonda, My wedding will be at an English-style bed & breakfast. The wedding wreath I am making is my own creation. I plan to weave ivy and berries around a circular frame and attach ribbons so that it hangs horizontally instead of being mounted on a wall. On the wreath, I will attach the charms so that they hang below the ivy. I found each of your charms to have a special meaning and thought they would be a beautiful addition to the wreath. They will remain in place, along with other symbols of our heritage, forever. I chose the wreath because it has no beginning and no end and continues in harmony. The wreath will be a part of our wedding, and I hope to add memorable tokens throughout our lifetime together." 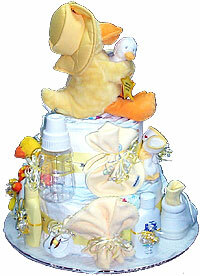 In the last couple of weeks, I have had two shower hostesses tell me they used towel/diaper cakes as the table centerpieces at the showers they hosted. The cake pull charms were used with the towel cakes. 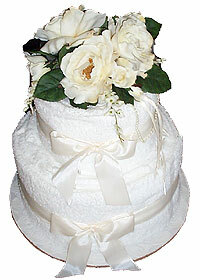 The bridal shower hostess said she bought towels from the bride's bridal registry to make the towel cake. The baby shower hostess used baby diapers (or you can use baby towels) to make the cake centerpiece. 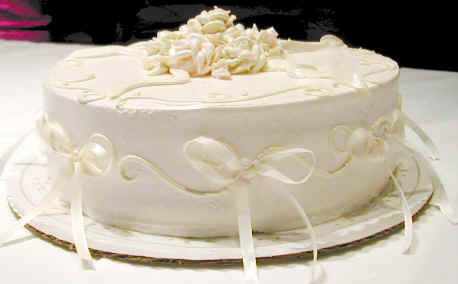 All you do is insert the charms and use the draping satin ribbons as part of the cake decoration. 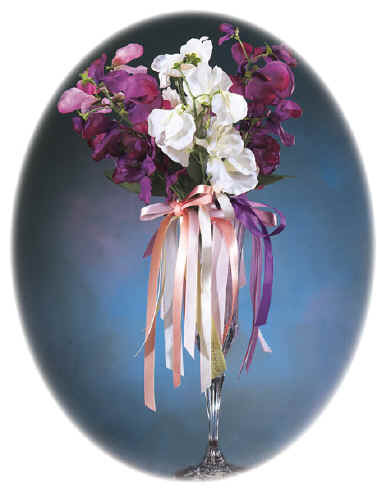 The centerpiece is also a gift to the bride or mom-to-be to take home. What about Wine Glass Charms? Do you like the idea of the charms, but do not want to use them in the cake? Use the charms as Wine Glass Charms...make each charm you select a wine glass charm for your brunch/luncheon/tea/shower etc. Pictured here is an order for charms on wine tags for a bridesmaid's luncheon. One bride told me she had a Hawaiian-themed (or beach-themed) Rehearsal Dinner, so there was no cake - just different desserts. She creatively placed the charms inside a large bowl of sand decorated shells on top. The girls pulled the ribbons from the sand. These pictures were sent to me from Lauren Duff in NYC, NY. Lauren hosted a bridal luncheon for her friend in Florida and she reported back to me that the charm cake (which is gorgeous!) was the hit of the day. These pictures are from Cayce Hagseth in Dublin, CA. She writes to me about her "pie" pulls: "In the group photo I am in a black top with sunglasses on my head. I did use a pie (our favorite, french silk, because it was the day before my wedding and I didn't want cake knowing we were having it at the wedding...plus, my girls and I used to have dinners and nites out beginning in high school and we love pie! !...all of the girls at the luncheon are my best friends through high school and college and they were all either bridesmaids or personal attendants..."
Cayce also purchased 2 horseshoe charms (symbol of good luck, power against evil, fortune, fertility) - one for herself and one for her groom. She kept her horseshoe charm on the satin ribbon, tucked the charm inside her bouquet and let the ribbon trail from her bouquet. Her groom's horseshoe charm was tucked inside his breast pocket (another idea: pin the groom's charm on his boutonnière). I had one lady order a sterling silver charm bracelet along with her cake charms order. She was hosting a bridal shower for her friend who was getting married. 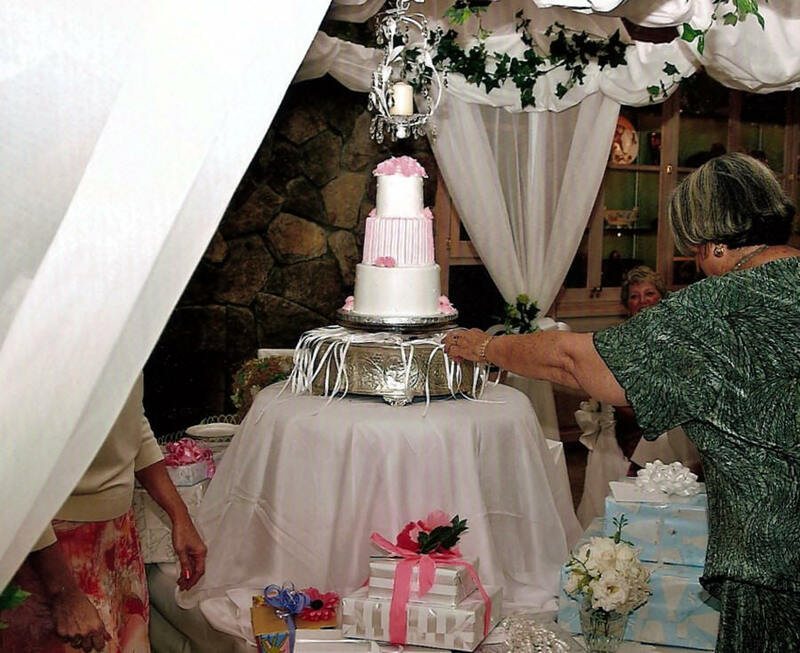 The bride had a bad year of illness and family death, so she wanted the bridal shower to be up-lifting. Each person attending the shower would pull a charm from the cake and this would be their personal prediction (as usual); but, each charm would then be added to the charm bracelet for the bride. This became her bracelet of good wishes from her friends for her new married life. 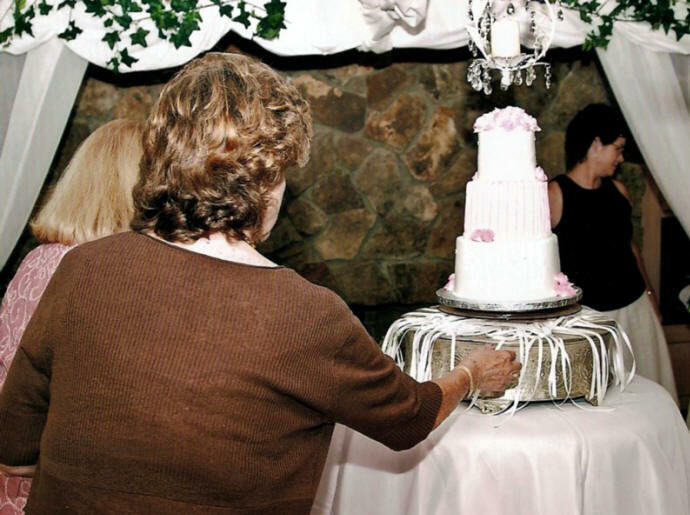 She wrote to me after the shower: "Hi, Rhonda, We just had the bridal shower, and I just wanted you to know that everyone loved the cake pull! 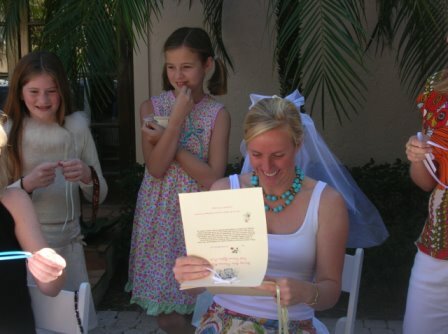 People really loved getting their fortunes, the charms were beautiful, and the bride was thrilled with how meaningful it all was, and that now she has a bracelet full of lucky charms to cherish forever and to remember the day and all of us! Thanks so much for all your help! :)"
These beautiful cake charms pictures are from Brooke Davi in Glendale, CA. 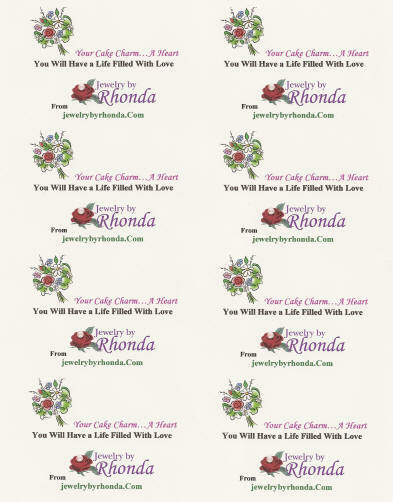 She writes to me: "Rhonda, Thank you for helping me with my bridal luncheon charm order last month. The charms arrived on time, and were perfect!... absolutely beautiful. You had asked me to send on a picture of our cake if possible. 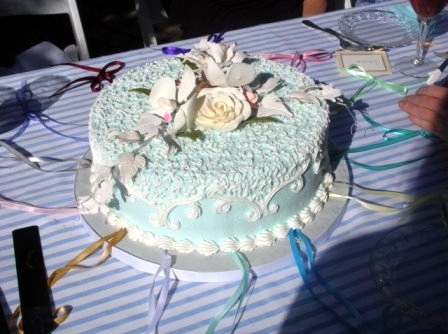 I'm attaching a few photos -- the lighting isn't so great, but I think you can still see some of the detail on the cake and see how we had the ribbon tied. Thanks again -- I will definitely be calling upon you should I need to plan another bridal luncheon." Hi Rhonda, My name is Becky Hicks. I am sending pictures to you from my daughter's Bridesmaid Luncheon yesterday. We had a marvelous day! My aunt Sue Phillips got the charms from you for the cake. They were absolutely wonderful! She told me you were a really special lady. We appreciate all your help. Take a look at these beautiful girls...My Emily is the girl dressed in black in the center of the girls standing behind the cake. Have a blessed day...Becky Hicks"
Quinceanera cake charms - what a great idea...this mother purchased a few of our prepackaged charm 6-packs for her daughter's Quinceanera celebration.